A man cycled the wrong way down a one way street in Eastbourne town centre and into the path of a car. Cyclist Colin McFarlane was airlifted to hospital after the crash at the junction of Langney Road and Susans Road on Saturday May 5 but died five days later. 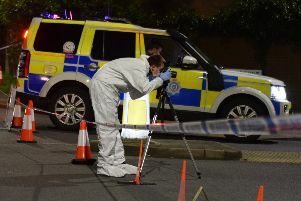 An inquest at Eastbourne this week heard there was nothing the driver of the car, Helga Scutts, could do to avoid 48-year-old Mr McFarlane who had cycled the wrong way down Susans Road and turned right into Langney Road. Witness James Knights saw Mr McFarlane moments before the accident and said the cyclist was “all over the road like he was drunk”. “The car driver didn’t stand a chance,” said Mr Knights, who rang the emergency services after the accident. Another witness, Marty Redgate, also said the driver did not have a chance to stop. Mr McFarlane lived in Ashford Road and is believed to have taken cocaine, according to evidence at the inquest. He was rushed to the Royal Sussex County Hospital in Brighton with head injuries but doctors told his brother, sister and daughter that he had suffered “catastrophic” severe brain damage and life support was withdrawn. He died on May 10 at the Royal Sussex County Hospital’s intensive care unit. Former police sergeant Alan Spicer from the road policing unit said in a statement the driver was not at fault. CCTV showing the accident and taken from a camera outside KFC was played at the inquest.